Giant masterpieces served in delicate half-egg shells. Puff pastries with layers of culinary surprises held within. Purees so tasty, you'd wish for a spoon to spare the embarrassment of licking the bowl. Some of the top chefs in D.C. came together this week under one of Washington's most elegant roofs to create one extensive and exquisite tasting menu. Want names? How about award-winning chefs such as Jose Andres of MiniBar, Eric Ziebold of CityZen, Michel Richard of Central and Citronelle, Mike Isabella of Zatinya and Daniel Boulud of the cafe that bears his name. The chefs did not need arm-twisting to serve their delightful dishes in the residence of the French Ambassador, but the guests who attended were strong-armed by Virginia Sen. Mark Warner, who played some combination of cheerleader and intimidator during the auction, raising tens of thousands of dollars for a special non-profit benefiting D.C. kids. The auction items included airline tickets to Paris and a luxurious condo stay, a weekend getaway at a 14-bedroom French chateau, a private dinner for 16 catered by Boulud and a private lesson from French tennis star Yannick Noah. 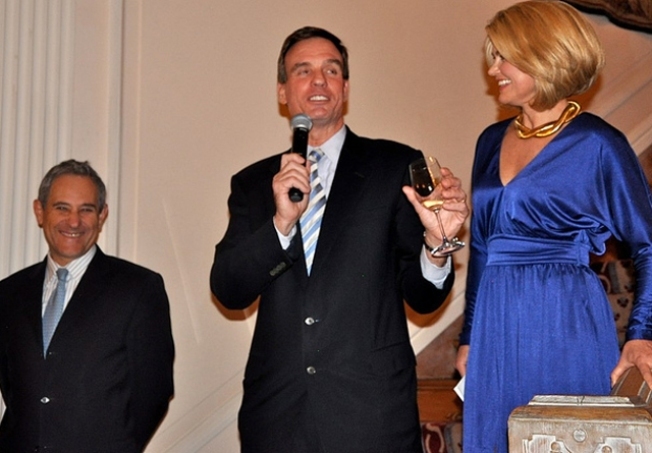 I was billed as the Master of Ceremonies, but actually played the good cop to Sen. Warner's bad. And Global Kids would've seen far fewer dollars had the Softie, rather than the Senator, been in charge. Global Kids, an organization for city high school kids interested in learning about the world and becoming leaders in it, launched in D.C. this week. It's been a success in New York City the last 30 years, and some of the program's graduates went to the reception to testify to that fact. One Georgetown University senior, an International Relations major, introduced herself and told NBC Washington that Global Kids was the spark that showed her life and ideas outside her subway stop. One Bell Multicultural student, who is in the program now, talked about his plan to earn a PhD, teach abroad, and become a clinical psychologist, all in that order, before the age of 30. Getting involved with Global Kids is not by invitation only. The young scholars cordially invite you to support their inspiring journeys. But prepare to be awed by their elegance, exceeded only by their ambition. For more information, click here.